Water Street Home How Much Water Does that Thanksgiving Turkey ‘Gobble-Gobble’? How Much Water Does that Thanksgiving Turkey ‘Gobble-Gobble’? I will venture to guess that as families go around the table on November 28 sharing what they are most thankful for, water will not be counted among the blessings – but it should be! In the spirit of the holiday, I’d like to give you some ‘food for thought’ before you enjoy your Thanksgiving feast. 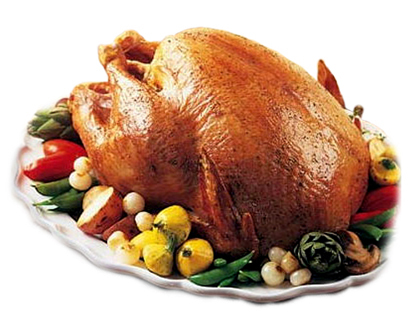 It takes approximately 330 gallons of water to produce a typical serving of turkey. The water footprint of a five-serving bowl of sweet potatoes is more than 103 gallons of water. Every acre of cranberry vines requires ten acres of water. On average, the United States harvests 40,000 acres of cranberry bogs, or 400,000 acres of water! The water footprint to produce the single loaf of bread used for your turkey stuffing is approximate 317 gallons of water. If you choose to wash your meal down with milk, you choose a water footprint of 67 gallons of water per one 8-oz. glass of milk. And when it’s time for cleanup, the typical dishwasher uses 15 gallons of water per load… and that doesn’t include what you use when you pre-rinse in the sink. So this year, when you look at your Thanksgiving table, stop for a minute and consider how much water was invested in your feast. Certainly, from the growing of the cotton or flax used to produce your cloth napkins, to the cold-water-thaw method used to make sure the turkey is ready for the oven on time, water is everywhere… and essential at every level. When you consider this, accessible high-quality water is certainly something for which we can all be thankful.